ATENEO Team B banked on the 45 points of Anton Asistio to beat the resilient Arellano Chiefs, 107-100, and take the Division II title in the 13th Fr. Martin Cup at the FEU Gym on Sunday morning. Asistio, who had a previous stint with the Blue Eagles in the UAAP, hit eight three-pointers and picked up the cudgels from CJ Perez when Ateneo Team B turned back the last of Arellano's comeback attempts. The young Kalookan City native scored 17 points in the fourth quarter alone, stepping up after the Chiefs battled back from 13 points down to pull within two points, 100-102 in the final 18 seconds. “Actually hindi ko iniisip na gumawa ng marami. Gusto ko lang manalo today. Thankful lang ako sa mga teammates ko kasi they found me for my open shots,” said Asistio. "Pero hindi lang naman ako ang gumawa sa game na ito. Team effort naman," he added. Perez, who is spending a year in residency after transferring from San Sebastian, scored 20 points and probed to be a major headache for Arellano coach Jerry Codinera. “Very timely talaga yung pagputok niya (Asistio), siya ang nagpanalo sa amin. 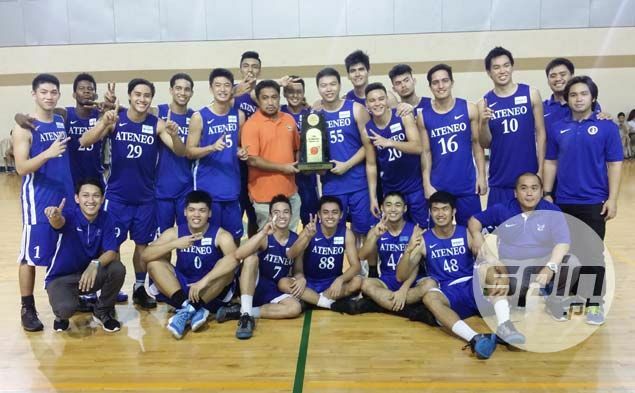 He was there when CJ was having a hard time going through the defense of Arellano,” said Ateneo Team B coach Yuri Escueta. Ateneo topped the eliminations with a 7-1 win-loss slate, its only loss coming at the hands of Arellano. The Blue Eagles disposed off UST, 83-62, in the quarterfinals before clobbering San Beda-A in the semis, 85-83, on Saturday morning. “I am just happy with how our boys played, most of them are really eager to return or play for Team A,” added Escueta. Codinera, the former PBA ‘Defense Minister,’ said he decided to coach his Team B so he can have a hands-on knowledge of the players he plans to bring up to his main team for the next NCAA season. “Ako na rin talaga ang nag-coach kasi gusto ko ako mismo makakakita sa talent, ugali at kakayahan ng players. Kasi ako rin mamimili sa Team A ko eh,” said Codinera.